The first step in learning guitar is mastering the major chords. As any new player will tell you, it’s not difficult to learn where your fingers are supposed to go for each chord, the real challenge is training your finger muscles to actually hit the desired positions cleanly. 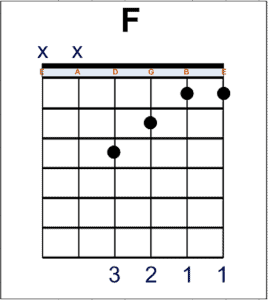 Of all the major chords, this challenge is most pronounced for the F (pictured above), which not only keeps your fingers devilishly close together on the fretboard, but also requires you to contort your index finger to somehow flatten two strings at once. There’s no shortcut to learning how to play an F: you have to force your hand into the cramped position, again and again, picking up the speed as soon as you become too comfortable. Each of these attempts (literally) strains you. This is not Guitar Hero: it’s uncomfortable and not at all fun. But if you stick with it, your muscle memory improves, and you get faster and cleaner. Then, one day, you’re able to play House of the Rising Sun. I’m bringing this up because learning to play the F chord provides a perfect case study of deliberate practice. It’s a clear goal that requires you to stretch your current ability and provides immediate and clear feedback on your progress. It’s also a goal that provides tangible rewards if achieved. To ask this question is to ask where in your schedule is the time dedicated to straining yourself (uncomfortably) to master something that you can’t do now but would be valuable if you could. This type of deliberate effort is a pain. It’s why most people give up learning to play the guitar (and why my skill level plateaued pretty quickly when I was younger*). It’s also why so many knowledge workers end up glorified e-mail sorters, nervous at every round of layoffs. But here’s the thing (if you’ll excuse the abuse of this analogy): if you’re not willing to strain your fingers, you’ll never end up the professional equivalent of the cool guy, surrounded by girls, strumming soulfully to House of the Rising Sun. * See Part 2 of SO GOOD for more on my guitar playing career and its relevance to understanding deliberate practice. I completely agree with what you have written. Still, I would like to make a few points about what you emphasize in your writing. Firstly, I feel that you overemphasize the negative features of deliberate practice— pain, discomfort, frustration. This adds a certain “ughness” to your work, which can stop you from even getting started. Secondly, you emphasize that deliberate practice has great rewards in career outcomes. This is true and important. But it also makes me feel somewhat “cheap”: as though I only work for improvement in my career status. Both these points build up to my main point: deliberate practice has its own intrinsic rewards. If you engage in deliberate practice—on your research problem or learning to play a song or an essay you’re writing—and break through to the other side: then that feels phenomenal. There is a certain clarity that feels meaningful and fulfilling. And I think working for meaning instead of just trying to optimize a career related metric or trying to acquire the trappings of an achievement—this to me, feels more human. I’ve nothing against career metrics, or enjoying the perks of status. Indeed, they provide essential feedback and protect us from fooling ourself. So, I don’t mean to be a romantic idealist. Still, the human dimension is essential. I agree with what you say and it’s important to think about the human dimension too when we are practising something. I guess Cal is giving advice that if we want to improve beyond the plateau – deliberate practice is a must. That’s where he drew the line about the human dimension aspect such as meaning and the likes. Finally, it’s up to us to decide what to do with our enhanced skills and elevated position on the career ladder. I agree. If you’re practicing your passion, then practice can be quite comfortable. Any discomfort is blocked out by Flow. Serious practice may be the necessary precondition for ultimate mastery, but deep passion is the necessary precondition for serious practice. Without passion, practice is draining. Burnout becomes inevitable. When I look at all the skills I’ve developed and the ones I haven’t developed, the developed skills required more practice. But I chose which skills to practice based on what I found interesting or passionate. Whenever I choose poorly, I would quickly burn out and quit. So if you’re burning out practicing for a skill, don’t force yourself to continue. It’s probably a sign you are in the wrong field. When you’ve found the right field, practice will become joy. I am living my dream – working in a field I was dreaming of since I was a teenager. I love the projects I work on, I love the environment I work in, I find the kind of work I do to be deeply meaningful. My work is a major part of my identity. I love it! If I’m passionate about anything, it’s my work. Yet, parts of my work are difficult. I can do them, but doing them is tough, and trying to do them better is even tougher. It can be so difficult to make progress that this virtually hurts. Yet, only if I forced myself again and again to go beyond my comfort level, to go beyond “good enough”, am I able to get better on a meaningful scale, think deeper, develop ideas further. I also experience flow. In fact, I have designed my life specifically to improve my chances of getting into flow. Flow is fun! As I understood Csikszentmihalyi, flow happens when your skill set just barely matches the challenge ahead, so that you need to focus and stretch a tiny little bit. When I need to focus really, really hard, and stretch a lot, I’m not in flow. Yet, a lot of important stuff happens at this point. This can be deeply satisfying, but quite painful at the same time. A bit like getting teeth pulled. Ain’t fun, can hurt a lot, but you know you need it, and that’s why you are willing to put up with it. I can still ‘enjoy’ this, but on a symbolic level: I am happy to do it because it is a harmony to who I am and to what I want to do with my life. Still hurts like heck. Short version: You can be passionate about something, and not be in flow. However, I don’t think that this kind of practice must necessarily be uncomfortable. Getting better at anything requires effort, but especially as you defined it, getting better through deliberate practice can actually be interesting (and even an addictive) process. This is especially true if one factors in the long-term career rewards of mastering valuable skills. In my own experience, the discomfort of deliberate practice comes from trying to increase an ability too quickly or in too many steps at once. In terms of learning a language, increasing your vocabulary one word or grammatical concept at a time is interesting (and rewarding), but trying to tackle a complex novel as a beginner is extremely uncomfortable. Would you say both are examples of deliberate practice? I think they are, but because the increments are different a lot more people can enjoy the former (and stick with it) than can do the latter (and not give up). None of this is to say that having ambitious goals shouldn’t be the ultimate goal; my point is simply that (when learning many things) people can do a lot of things to level up their skills and at the same time enjoy doing so. Cal, thanks for the post — and especially the “F-Chord” analogy. I will be asking “where’s my F-chord” in a number of areas this week. As to the comments above, I disagree. If it’s not “uncomfortable” it’s not deliberate practice. Uncomfortable and painstaking practice can also be joyful, fulfilling, and meaningful practice — but it’s still uncomfortable. Incrementalism and comfortable practice will be less fulfilling because it leads to mediocrity. Whether somebody improves their skills and increases their understanding at a comfortable pace or an uncomfortable one, they are still moving forward. And if moving forward is the goal, particularly over long-term projects such as mastering a language or becoming a trailblazer in a particular field, the steady pace is not only more enjoyable it also is the one with a proven track record of success. There will be some discomfort in the course of anything. That’s especially true at higher levels, where the steps to learn something or the feedback available isn’t clear. But the less somebody begrudges effort and the more they learn to focus on one single (part of a) problem at a time, the more interesting the process will become and the more they can tackle one thing after another on the way to becoming truly excellent. I do agree with you that this is moving forward in increments. It’s making small corrections toward a large goal or small improvements in a skill. But isn’t this how Toyota has relentlessly pursued perfection all these years? I would argue it is. It’s also how Warren Buffett came to amass a wealth of knowledge (and money) or how Nevil Shute came to write some of the best novels ever written. These guys weren’t focused on feeling uncomfortable. They just went to work each day and like a snowball picking up snow as it rolls down a long hill, they accumulated more wisdom and more skill along the way. And that is what led to their praiseworthy results. Now you can probably come up with counter-examples, examples where somebody went all out from the start and achieved something great. But most of the people who begin that way are the ones who don’t even make it to mediocrity–because they burn out quickly and then go looking for their “passion” somewhere else. Thanks for taking the time to put together a thoughtful response. I have a question. The incremental approach you describe: Do you think this is a better alternative to deliberate practice or that deliberate practice can be incremental and therefore remain comfortable? I don’t think breaking things down to bite-sized units and tackling each at a comfortable pace is an alternative to deliberate practice; I think it’s deliberate practice at it’s best. It’s obviously not always possible to break something down into a clear thing to focus on or learn, especially at the forefront of a field. And in certain careers where time is against you, such as many professional sports, a more punishing pace is mandatory. However, within the context of a career spanning many decades, tackling one new thing at a time in a steady, comfortable way is hard to beat. In any case, I should stress that whether a person feels uncomfortable or comfortable in their pursuit of greater skills, the point is to get them. So while I think it’s best to achieve great things and enjoy the process, I think that while working the question “Am I having fun?” is absolutely horrible–the equivalent of “Am I pursuing my passion?” when thinking about one’s job more generally. That’s because it robs you of focus and also because as Newport points out there are times when the “practice” can be staggeringly difficult. During those times, I think you just have to work hard–though in a weird way you can get enjoyment out of that too, because of the new heights you’ll be able to see from, because of what that new knowledge will allow you to do, because of the rewards of that, and so on. The reason he mentions the negative features is because it is those very features that are necessary to improve but your average person avoids them because of discomfort. Most people when doing an activity start out in the cognitive phase where every bit of information is new information and your brain is struggling trying to get a feel for the new activity this is deliberate practice because beginners are always making mistakes and then they learn enough until they can do the activity at an acceptable level. At this point they can do the activity on autopilot now that they have the basics down but they practice solely on autopilot and hit plateaus. The very best do not stay in autopilot long and find weaknesses in their technique and come up with ways to practice that puts them back in that cognitive phase. This is usually uncomfortable because it is attempting to master something they don’t know instead of having fun with what they have already mastered. People who have a drive to be really good at something understand this and are happy when the training is uncomfortable in this way because they look at it in the long term that they will be so much better and not in the short term of “This practice session is going to feel awful”. This is also why you see so few people at the top in activities but thousands or millions that are average. People at the top have dedicated years of deliberate practice towards the activity most likely whereas the general population either finds the activity as a hobby and the more you do something for fun the less likely you would want to make that activity not fun in anyway unless you had a stronger drive to become so good that you would endure a little pain along the way. One thing that is cool about deliberate practice is that you don’t have to do it all the time. You don’t have time to be the absolute best at every single activity you take on but if you understand the principles of deliberate practice you can use it to get from one level to the next and then go back to autopilot if you are at an acceptable level. Maybe you just want to be above average at everything you do so you learn something then use deliberate practice to get above average and then stop. For things like work and school it pays to go a little further than above average but everyone has their priorities of how good they want to be at something and the main idea is you are not limited by your plateaus and the fastest way to improve is introducing more deliberate practice like activities. Since F-chord type exercises can be difficult to find in knowledge work, I thought I’d mention a few that I have used in the past. The first is trying to learn short cuts in software. If you spend a lot of time using Excel, for example, learning a few of these per week can dramatically reduce the time it takes for you to complete tasks. This doesn’t necessarily require that you set aside specific time either because, if you have your shortcut in mind all day, then your practice is trying to use it as much as possible. The second has to do with making better use of writing emails. Cal rightly criticizes the tendency of knowledge workers to become “glorified email sorters,” but why not take advantage of the many emails we must write to enhance your writing skills. Strunk and White’s The Elements of Style is a classic book on writing that has many easy to understand maxims that we can try to use more regularly in our emails. These two tips integrate deliberate practice into our work making it “easier” to accomplish. Does anyone else have some suggestions in this vein. A distinction needs to be made here. There is discomfort inherent in learning anything. When it is physical, there is literal pain. I play the guitar. I love to practice. But when I first started, it was uncomfortable. You have to be passionate about the progress to a point where the discomfort becomes just another part of the process. But to deny the discomfort is, sorry, fantasy land. The risk in ignoring the reality of the discomfort is the message it sends. Many, and I mean MANY, don’t try hard enough and long enough because they read somewhere that success comes when you are passionate. As soon as they experience the perfectly NORMAL presence of discomfort, they quit. Why? Because they somehow were mislead to believe that everything should feel terrific all the time. Please. Nothing is further from the truth. Navy Seals become Navy Seals because they embrace the pain. They don’t deny it’s existence. The world needs less drivel about passion and more insight into the realities of living a purposeful life. My mother always said, be passionate about being able to take care of yourself. The rest will fall nicely into place. Embrace the “pain”. It means your making progress. Ingnore ANYONE and EVERYONE who says it shouldn’t hurt a little. It does. It always will. And that is precisely why so few ever truly live!!! I don’t know about that. I’ve gotten pretty good at many skills simply by following my passionates and doing what was interesting. Whenever I fail to follow my passion, I only end up on a distasteful path that I soon realize isn’t the real me and I quit. Yes, even in my passion, there have been moments of discomfort–but the passion overrides the discomfort and lets me push through. But without motivating passion, the discomfort eventually becomes unbearable leading to burnout. Passion makes discomfortable bearable. No passion makes discomfortable unbearable. I think Navy Seals are passionate about being Navy Seals. My point is NOT the elimination of passion. It’s having passion in the proper perspective. Passion is NOT the absence of some discomfort. To your point, passion for what you do helps you embrace the discomfort. And note also, it’s different for each of us. Some people find the act of academic learning easy. Others do not. For those that do not, should they quit because it’s not joyful? Or should they struggle through because there is meaning in the struggle? There is value in the struggle? I became a CPA. Was not for one moment, a joyful process. But when I obtained the designation, I was proud of myself for not giving up. I wasn’t passionate about being a CPA, I was passionate about the process of becomming one. I heard a story about Joni Mitchell years ago. She had such trouble playing F that she changed the tuning on the guitar so she didn’t have to hold down the 1st and 2nd strings with the same finger. I had trouble with barre chords until I saw Pete Townshend play “Pinball Wizard” and saw that he didn’t hold down all six strings with his index finger, but used his thumb to finger the 6th string and deadened the 1st string with his index finger. It still took a long time to get it clean, but, as you say, it was worth it.